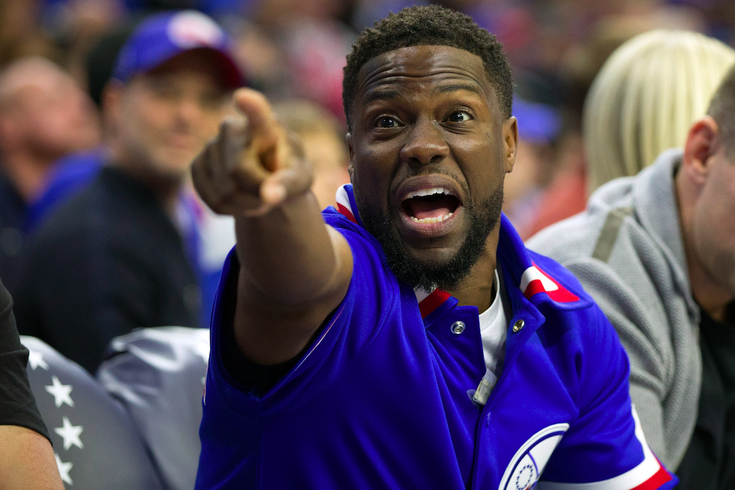 Comedian and actor Kevin Hart reacts during the first quarter of action between the Philadelphia 76ers and the Miami Heat in game two of the first round of the 2018 NBA Playoffs at Wells Fargo Center on April 16, 2018. The easiest way to explain the Sixers losing game two to the Heat on Monday night is that it was all Kevin Hart's fault. That's more or less what Dwyane Wade, who had a team-high 28 points for Miami, said after the series-evening tilt in Philadelphia. Hart wouldn't shut his mouth the whole game. He made Wade, 36, look 26 again. Standing courtside during the game, Hart looked sick to his stomach as the Sixers struggled to climb back into the game. Miami shot 48.8 percent from the field on Monday night. It really seemed like everything fell for them at every important juncture in the game. At first, Hart responded to Wade with a few words on Twitter. He's going to Miami. Wade fired back — no you're not — and implied via emoji that there will be no rings for Philadelphia. Everybody knew that wouldn't be the end for Hart. This is the guy who stormed onto the field in Minnesota, completely unauthorized, after the Eagles won the Super Bowl. And then cursed on live TV during an interview with Fletcher Cox. .
Sure enough, Hart posted a message for Wade on Tuesday afternoon. The Sixers will now head to Miami for game three on Thursday night. Maybe Hart should taunt Ben Simmons instead this time, or else plead with the team to let Joel Embiid back on the floor.